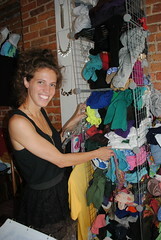 Laura Kuhn Looking for some last-minute gifts that are environmentally friendly? An option might be Sunbeam Candles, which are made from vegetables and beeswax in solar-powered factories. The holidays mean presents but if the lack of green gift options has you seeing red, here are some last-minute sustainable solutions from East Village stores. Sustainable NYC (139 Avenue A at Ninth Street), opened three years ago when owner Dominique Camacho, was renovating her apartment. “I’d been in retail almost 17 years,” she said, “and I got bored. I got really into re-using things in my apartment.” She took an energy and environmental design course and opened her store. 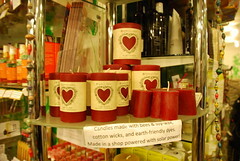 Sunbeam Candles ($7.50-$17.50) are all made from vegetables and beeswax in solar-powered factories. “They’re also really good about packaging,” said Ms. Camacho of the company’s box-return program. For a party gift, bring a bottle of wine and a Bitters and Co. Reclaimed Cork Stopper ($6.25). The company also makes sustainably-harvested Cork Coasters ($12.50). The store is also filled with decorations from compostable Oots Seed Ornaments ($3.50 each) that can be planted after the holidays to Laser-cut Ceramic Butterflies ($44.95) made from vintage china.